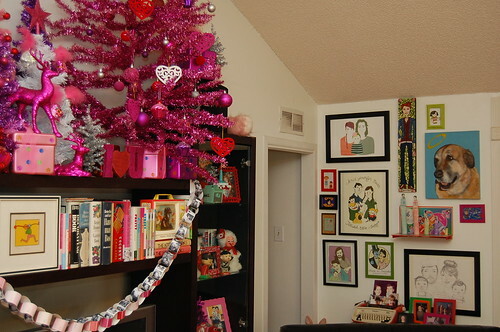 I didn’t realize back in November that when I was putting my Christmas trees up I was also decorating for Valentine’s Day. 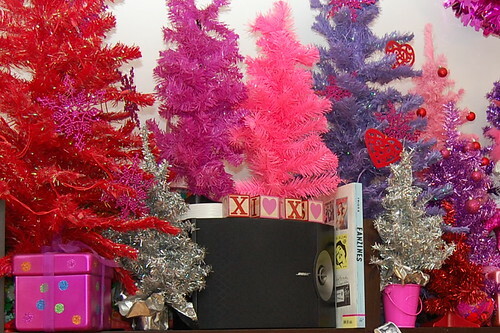 My menagerie of pink, red, silver and purple trees atop the entertainment center were so cute I wanted to keep them up just a bit longer. 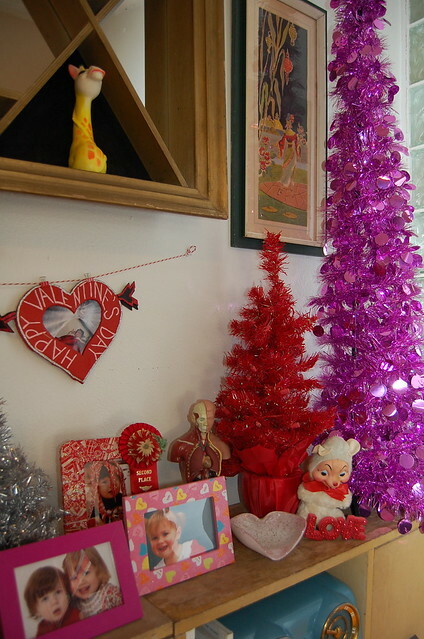 All I did was swap out a few ornaments, added some hearts and love was in the air. 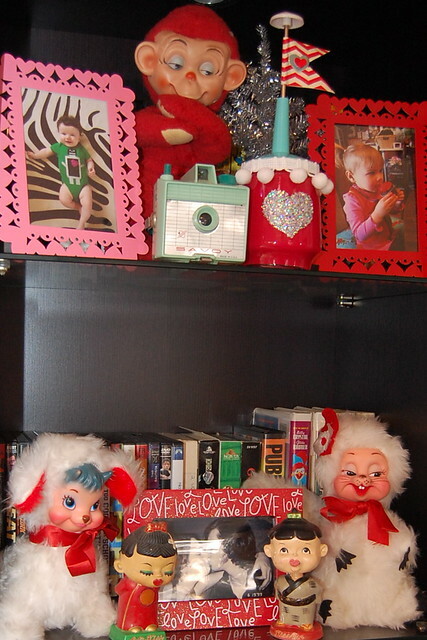 Of course the entertainment center is not the only place in the house seeing a little Valentine’s Day action. You know me better than that. 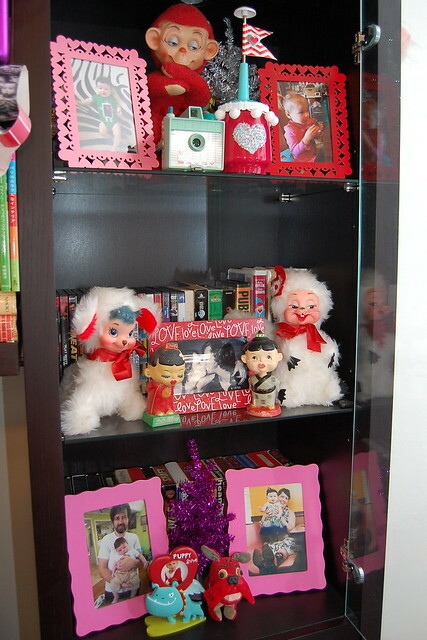 One of the things I love about decorating seasonly is changing out all my picture frames. That way I get to have new pictures up all the time. 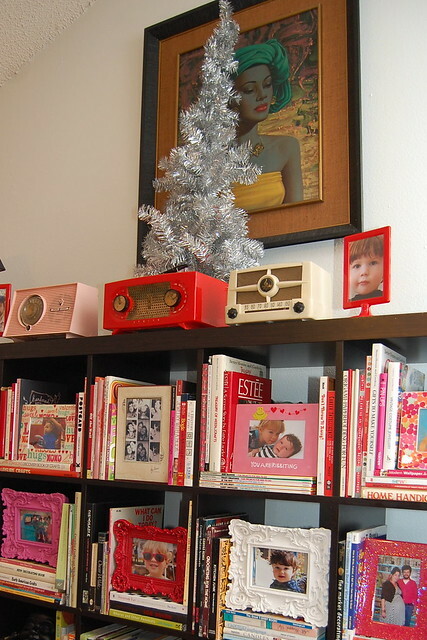 I spy a picture of Baxter in his adorable little heart elbow patch Valentine’s cardigan I made last year. 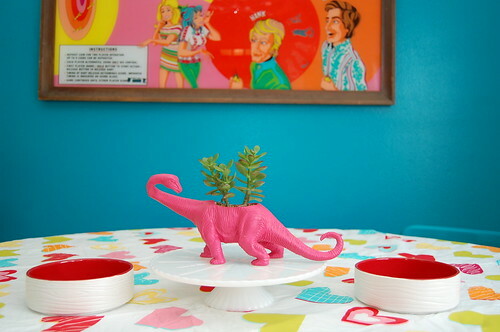 The inspiration for my Christmasaurus sits proudly in the center of my kitchen table. I need to fill the little dishes with conversation hearts. 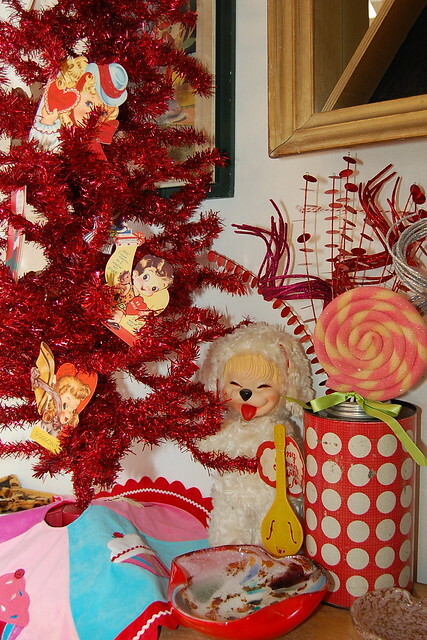 I gathered the rest of the Valentine’s Day colored trees from around the house and decorated them with my collection of vintage Valentines. 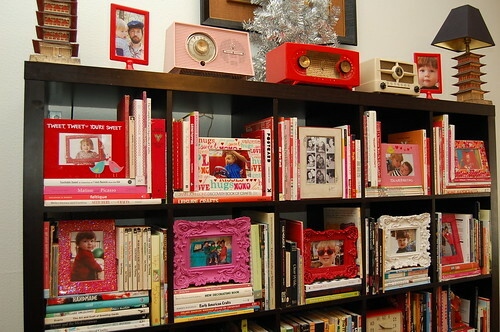 Look close and you can see the Valentine’s Day picture frame I made last year. 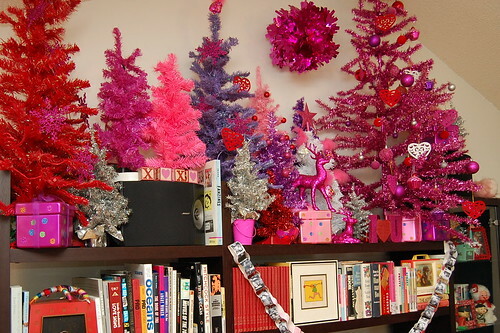 Ok, back to the sea of trees on the entertainment center. 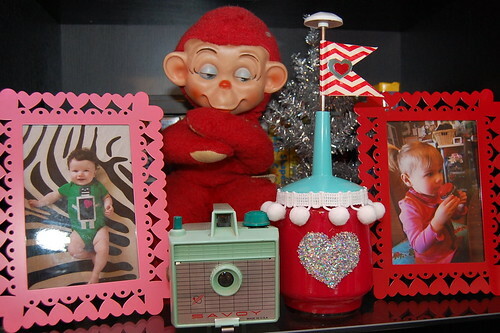 I need to add some pictures of Baxter to my Valentine’s Day Photo Strip Banner. As much as I hate my giant black entertainment center that is so 80’s it looks like it should live on the set of Less Than Zero, I do love all the shelving. 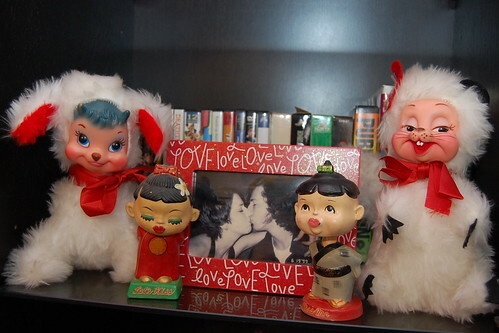 Not only does decorating seasonly allow me to change out my picture frames, it also let’s me display some of my fun collection of kitsch that usually sits in less prominent places in the house. 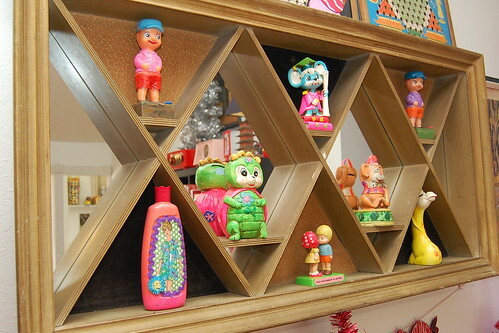 Special rubber faced dolls, dream pets and kissing nodders fill the shelves for the next couple of months. 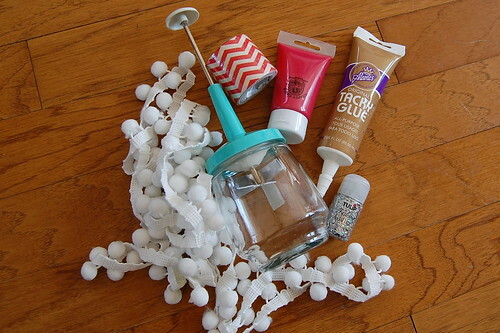 So about that craft tutorial I mentioned…. Yesterday when I was at the thrift store I happened upon two vintage nut choppers that begged to be made over. The green one is soon to be a terrarium and the aqua one is now a Valentine’s decoration. 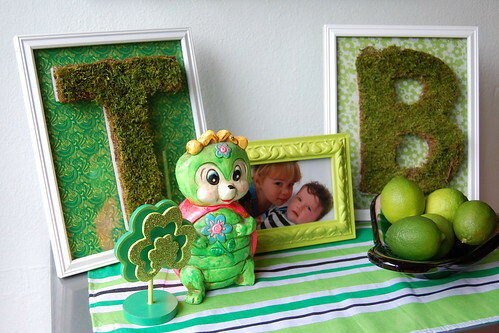 Today for I Love to Create I will show you how to make your own. Why should Mason Jars have all the fun? Just about anything you can do to a mason jar, you can do to a nut chopper or any glass container for that matter. First I decided to decorate the lid to my nut chopper. 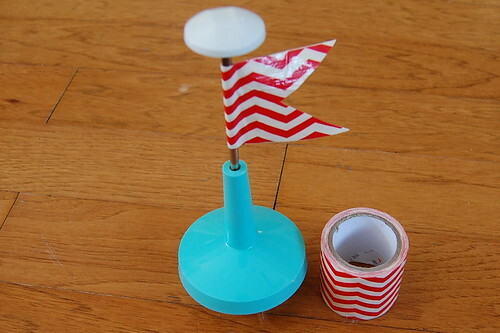 Using washi tape I made a little flag. All I did was fold a piece in half onto it’s self and then cut a triangle. 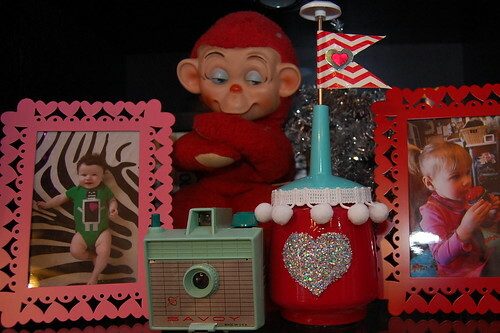 Everything is better with pom pom fringe, nut chopper Valentine decorations included. Using Aleene’s Tacky Glue I attached the fringe to the nut chopper lid. While the glue was drying on my fringe I took the glass jar outside and filled it with a good amount of red Crafty Chica Paint. Swirl your jar to ensure even coverage. On the outside of my jar I painted the shape of a heart with a paint brush and Tacky Glue. 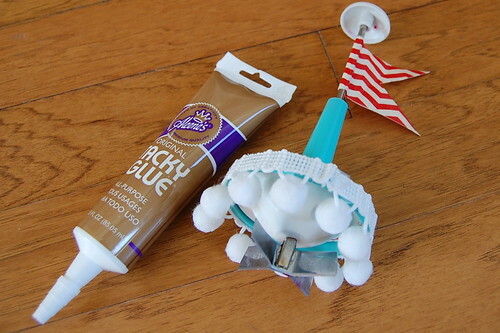 While the glue was still wet I sprinkled it with glitter. 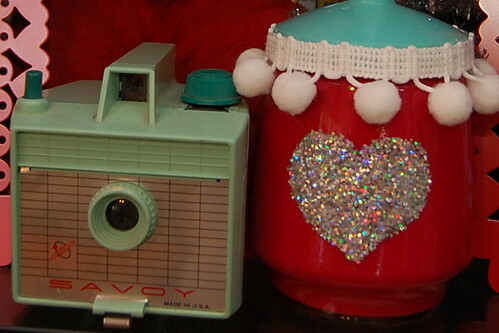 All that was left to do was shake off the excess glitter, screw on the lid, add a heart sticker to the flag and display. So what do you think? 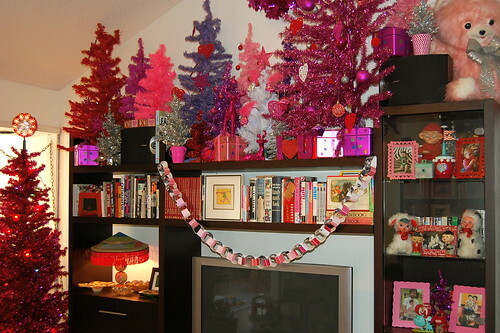 Would you walk into my house and think “Why hasn’t she taken her trees down?” or would you suddenly feel the love? 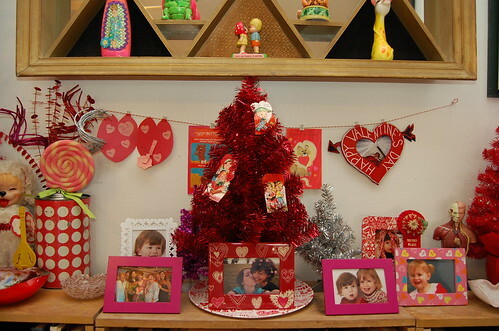 Posted January 12, 2013 & filed under I Love to Create, Valentine's Day. 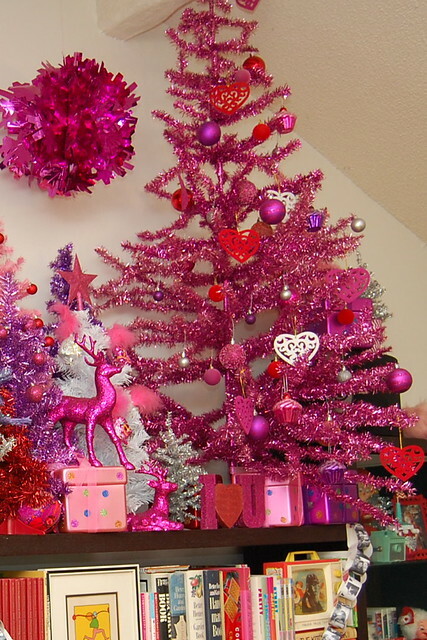 I would feel the love, your decorations are great fun! This post makes me so happy. I love V Day. Sharing to my crafters on Coastal Bohemian on FB. Hoping you’ll post at Funtastic Friday link party too. 9pm on Thursday nights. Thanks so much for sharing Michele. 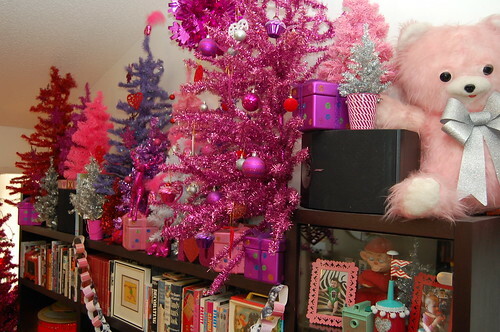 Why not keep that tree up year round! 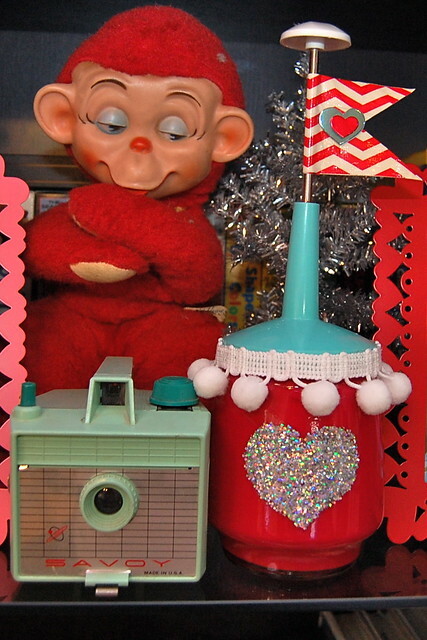 I love all of your valentines vingnettes! It’s so much fun to look at all of the details!